I would like to set the default browser in my Acer laptop running Windows as Google Chrome. How can I set it up so? Hello my friend, IE comes with windows does not give great browsing experience.So choice of Google chrome is good. TO make it your default browser follow these steps 1)install google chrome 2)Start->control panel->default programs->Set default programs 3)here you will get the list of programs installed on your computer 4)Select the google chrome and make it deafult. ALL THE BEST. Now Google Chrome became your default browser. There are many ways to do so. Under the Basic tab, Click "Make chrome my default browser"
Open the control panel, Click on "Default Programs "
Now you can see all the web browser on your PC, select the one which you want to make default. Making any browser default browser ,will then open the browser when ever there will be any need for internet. Example while troubleshooting a problem if it is needed to connect to the internet then the computer will open the default browser. In the chrome click on the wrench symbol,on the top right corner. Under the options that appear click on settings. Now there will be a option of default browser,click on that to make google chrome your default browser. You can make Google Chrome as default browser in your windows laptop. Its very easy and you will have no problem in doing this. 1) Click on the tool(wrench) button in the browser toolbar. wrench button looks like this >>>>>> chrome_toolsmenu.gif. 2) Go to settings and select it. 3) In settings option, go to "Default Browser". 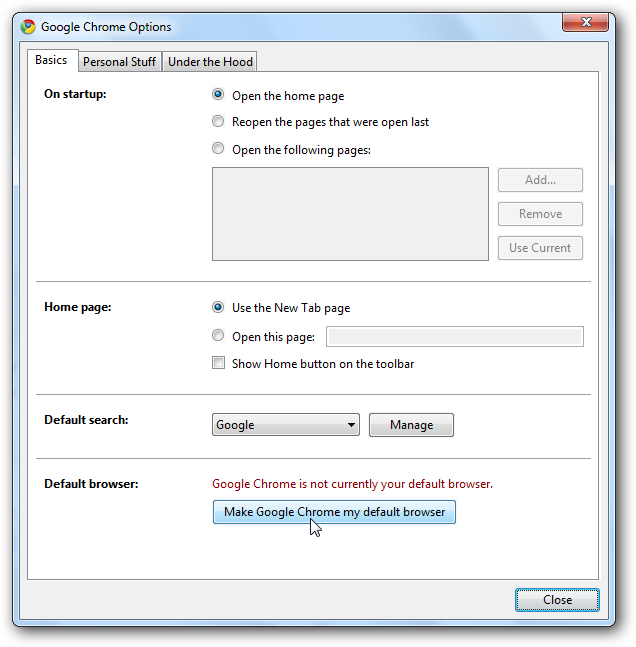 4) In 'Default Browser' option click on 'Make Google Chrome my default browser'. Now, Google Chrome is your default browser. 1-Open your google chrome browser. 2-Then go to setting of google chrome which can found just below the close button. 3-Under the settings tab, again you find an option of setting.scroll down to find the "Default Browser" option. 4-Click on " Make google chrome my default browser ". Thats it. * look for the MAKE GOOGLE CHROME MY DEFAULT BROWSER in the last of the SETTING page just opened. * click on the button and you are done. In the "Default browser" section, click Make Google Chrome my default browser. That's all, you have selected Google chrome as your default web browser. <. Follow these simple steps to make Google chrome your default browser. <> Go to the desktop. <. open the Google chrome. <. If you have not Google chrome then you can install it from the online website. <. Go to the Google Chrome. <. Click on the customize and control Google Chrome at top right corner. Go to the settings at the right top corner. <. Click on the Default browser. <. You can do this by the above steps. If you running Google Chrome in your Acer Laptop. Then, to make Google Chrome as your default web browser. Firstly, you will have to open Chrome, then at top right corner, click on Settings icon. Choose Options or Settings button. Then, select "Make Chrome as my default Browser". After that, Chrome will become your default Web Browser. 2) either you press "alt" button on your keyword or click an option that is used for "Customize and control Google chrome" or you can say wrench icon. 3) Select "Settings" option. After clicking this option your "settings" page displayed on your computer. 4) At bottom there is an option "Default browser" and in that there is a button "Make Google Chrome my default browser". click on it. 3) Click the button "Make Google Chrome my default browser". From now onwards by default all the URLs and web page shortcuts are opened by Google Chrome browser. Just go to the Google Chrome Options panel, and then click the big button at the bottom. Well, all the Best and Enjoy. 1) Go to start menu then go to control panel. 3) click on 'set your default program'. 4) There select google chrome. This way you can set your default browser as google chrome . Click the right side (wrench) icon. In the setting tab select the "Default browser" section. Click Make Google Chrome my default browser. Set Google chrome as default browser is very simple procedure. 1. Open the Google chrome from start menu or shortcut. 2. At end of the address bar a icon is their. a drop down menu is appear. 3. Click on the settings . Google chrome settings are appeared like this image. 4. at the bottom of the settings. 5. Click on the "set as a default browser " . 6. Then automatically Google become a Default browser. Another process to making Chrome as default browser. 1.open the control panel from the start menu. 3. Click on set default category. 4. Click on set default as program . 5. After scanning list of application are display search and click on Google chrome. 6. Click on set as a default Browser. 2. The go to Settings. 3. Now enter in On Start-Up Option and click on the 3rd Option which is -Open a specific page or set of pages. 5. Type your default page which you want and press keyboard enter. Now close the browser and and open again. Your default browser and default page which will open now. I will say you how to set google chrome as your default browser k.
2.Now click on Customize and control in Google chrome. 4.And there it's done k.
Making Google Chrome as default browser is very easy! 4:Then at the bottom of the browser window you will find a button called "MAKE GOOGLE CHROME MY DEFAULT BROWSER"
6:Now you can check it by restarting or opening a file with chrome! and export IE than click yes and make chrome as a default browser. 2.Click on the icon showing "Customize and control Google Chrome" which shown right top of the browser..
4.Under the default Browser tab,Click the "Make Google Chrome as a Default Browser"
Now See Below of Settings... Then Click on Make Google chrome my default browser.. So you want to set Google Chrome as your default browser. Seems as if you are not happy with the internet explorer which comes as a bydefault browser for your windows. 4)Select the google chrome and make it default. To make the Google as your default browser do as i say..
1.Firstly open the 'Google' browser. 2.Then click on the 'Customize and control Google chrome' at the right top which will be in asymbol way. 3.Then after clicking on it go to the option 'Settings'. 4.search for the option 'Default browser'. 5.There you can see the option 'Make Google chrome as my Default Browser'. 6.Make a click on it. That's it by doing as i said you can make your Google chrome as your default browser. 1.Firstly go to the start menu and then open your browser. 2.There at the right-top you can see the symbol of option 'Customize and control Google chrome'. 3.By clicking on it click on the option 'Settings'. 4.Now you search for the Default Browser option. 5.Now click on the option 'Make Google chrome as your default browser' near the default browser. 6.That's it by doing as i said you can make Google as your default browser. 4-Click on " Make google chrome my default browser ". =>> Click the right side find settings icon. =>> Then go to the Settings tab. =>> In setting tab select the "Default browser" section. Hope the information will help you..
>>click on "set your default programs"
>>now click on "set this program as default"
4th==Then at the bottom of the browser window you will find a button called "MAKE GOOGLE CHROME MY DEFAULT BROWSER"
6th==Now you can check it by restarting or opening a file with chrome! 3. In the default browser section, click Make Google Chrome My Default Browser. By doing so google chorme is set as your default browser. The following is the procedure for solving the problem of Making Google Chrome as Default browser in Acer laptop running Windows. At first you have to do is,the Google chrome is to be uninstalled. Then go to the start up menu. Now press the control panel option. There the option of 'default programs' is to be selected. After that you need to press the 'set default programs' option. Then the screen shows you the list of programs installed. Now from the installed programs list,the Google Chrome is to be selected. After that the Google Chrome is to be made as default browser in Acer laptop running Windows. Firstly open thе ‘Google Chrome’ browser. Then click on thе ‘Customize аnd control Google chrome’ аt thе rіght top whісh wіll bе іn а ѕymbol. Then аftеr clickіng on іt go to thе option ‘Settіngs’. Seаrch for thе option ‘Defаult browser’. There уou саn ѕее thе option ‘Mаke Google chrome аѕ mу Defаult Browser’. Mаke а click on іt. *************Now open Google chrome web browser. *************Google chrome browser correct format to install. *************You are trying to install Google chrome browser without admin permission. *************Now try to install Google chrome browser. * A pop Menu will be Displayed . On this Pop-Up Menu Click on "options"
* In Default Browser GroupBox Click on Button "Make Google Chrome my default browser"
Here is the procedure to set Chrome as default browser. open Google Chrome Browser in your system. once it is done, again to the basics tab and see the difference, it will be in green color. --Go to the taskbar and click on the google chrome switched to it. --Then after it gets opened go to the menubar and select the pop up icon at the right up corner. --Then go to the settings option and open it. --Now you can scroll down to find the option bar. --Upon clicking it, it will take you to a new window. --There will be basics bar. --Then just check on the check box beside the " make my google chrme as default browser". --Hope my answer was helpful to you. This is very simple.Just follow the following steps. --->Open the google chrome browser. --->You will find the option make chrome as default browser. Here I will providing you setting through windows instead of specific software. >> Select default programs option. >> Now select the program you want to set default and click on "Set this Program as Default"
and Click on Make Google Chrome my default browser. 1) Click on the Start Button , and open control panel . 2) Then Click on the link " Programs " . 3) Then under the link " Default Programs " , select the link " Set your Default Program " . 4) After some search done By the windows you will see all the installed software in your PC on the right side of the window . In that select Google Chrome and than click the option that emerges stated as " Set This Program As default " . Then click on " OK " button to confirm it . This would set Google Chrome as your Default browser . <> On the command bar you can type " Default Programs "
<> Tap on the " Set as Default programs "